SPIPA Training for Competitive Exams 2015 – Sardar Patel Institute of Public Administration (SPIPA) invites online application for entrance test of admission in various Competitive Exams like UPSC, GPSC, IBPS, RBI, SBI, LIC, RRB etc Training 2015-16, More details given below. All other necessary details with respect to candidate education qualifications, age limit, exam fee, SPIPA & Regional Training centre no. 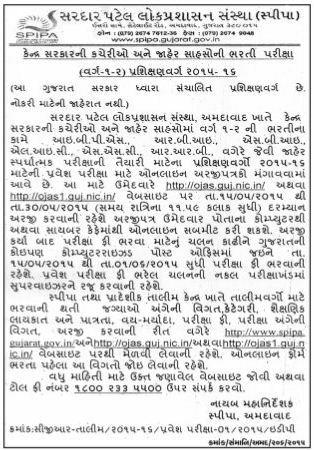 of vacancy/ category, details pertaining to exam for how to apply, how to download or print hall ticket etc are made available on website http://www.spipa.gujarat.gov.in and http://ojas.guj.nic.in/ or http://ojas1.guj.nic.in/.Candidates are requested to visit the website carefully before submitting the application form.